Months after Breitbart released an internal Google meeting showing executives weeping to a large crowd over Hillary Clinton’s loss of the Presidency, another Google Executive had an outburst over twitter on Kavanaugh’s confirmation. 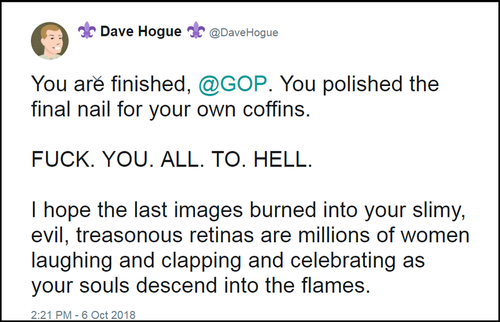 Hogue, a Google US design lead who has been with the Mountain View, CA company since December 2013, confirmed that he deleted the tweet - and that the opinions expressed in it "are mine personally." Google naturally stood by their own with a statement to Fox News, "A Google spokeswoman told Fox News via email: "What employees say in their personal capacity has no bearing on the way we build or operate our products."